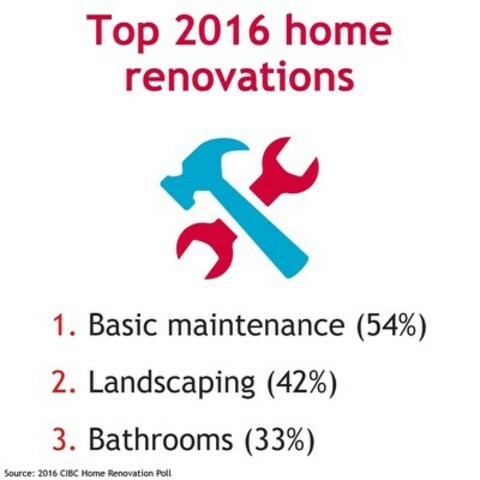 TORONTO, June 22, 2016 /CNW/ - A new poll by CIBC (TSX: CM) (NYSE: CM) finds that Canadians homeowners planning to renovate expect to spend an average of $13,000 on home improvements this year as the renovation focus shifts to the outdoors, such as building or repairing decks and patios and landscaping yards and gardens. But, many homeowners worry they will overspend (52 per cent cite as key irritant). "The poll findings show that Canadians are focused on outdoor projects," says Scott McGillivray, host of HGTV's Income Property. "Spending more on the outdoors may not necessarily be the first option when it comes to return on investment, however you should never underestimate the value of curb appeal. If you've already taken care of the big hitters inside the home and have the renovation funds, why not turn your attention to outdoor projects?" "Whether you hire a contractor or do it yourself, you should have a good understanding of how much your project will cost and build in a contingency for potential overruns or surprises," says Barry Gollom, Vice President, Mortgages & Lending, CIBC. "It's critical to stay on budget as it is easy to lose control of your spending if you don't have a detailed and comprehensive plan." For those planning renovations this year, CIBC offers a Home Renovation Checklist that provides homeowners with valuable tips and advice to keep their project on track. Do you have a detailed budget for your upcoming renovation? From May 19 to 25, 2016, an online survey was conducted among 2,129 Angus Reid Forum panelists who are Canadian adult homeowners. The margin of error - which measures sampling variability - is +/- 2.1 per cent, 19 times out of 20. The results have been statistically weighted according to education, age, gender and region Census data. Discrepancies in or between totals are due to rounding. 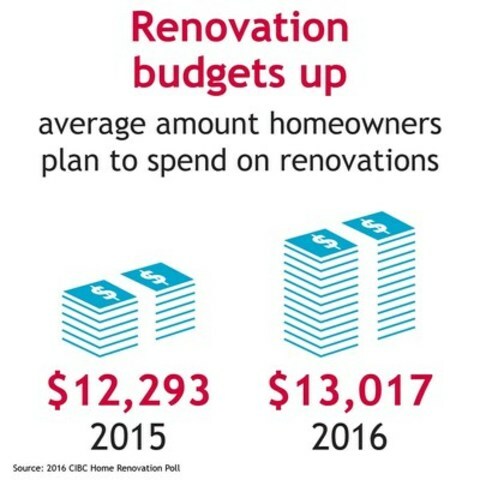 Comparisons to CIBC's new release "Home renovation budgets down for Canadians in 2015: CIBC Poll" on May 8, 2015, are not possible due to a change in methodology.